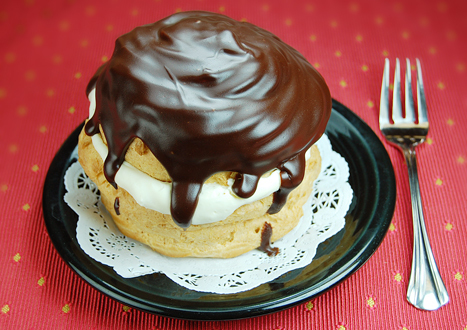 Metropol Cream Puff—a classic we’ve made from scratch for 35 years. Handbeaten French choux pastry forms the unique casing for rich crème patissiere and fresh whipped cream flavored with pure vanilla and a hint of orange liqueur. 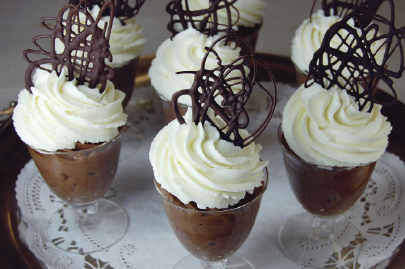 Shiny, dark chocolate ganache generously spills over the top. Servings: generally 2 per puff, but a dedicated addict can consume one at a sitting. Croissant bread pudding—a rich twist on the usual bread pudding. Our flaky, all butter croissant baked in rich cream custard and studded with dried cranberries and roasted pecans.